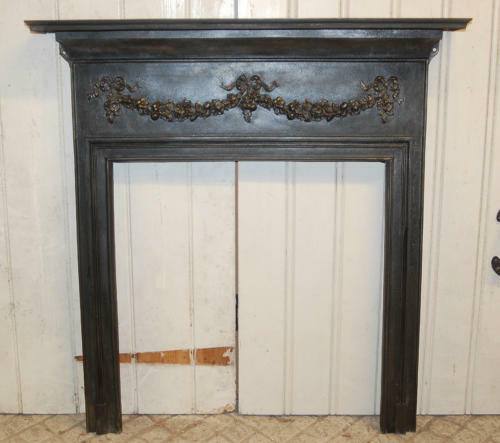 A very pretty Victorian, cast iron, fire surround with heavy mantel and pretty design. The fire has a lovely, classic design, typical of the era, with flowers, swags and bows. The fire has been blacked and polished giving a rich finish and a slight silvery finish to the crossbar. The fire opening has a linear border and both fixing lugs are present and intact. The mantel is of a good proportion, with a stepped border. The fire is well constructed, heavy and solid. The fire is an antique and therefore has some signs of use and wear. The fire has been trimmed and the trimmed edge can be seen from the back. There are some deep scratches to the crossbar near the bow detailing and there are some further scratches, casting marks and knocks. There are very small areas of surface rust to the front, for example at the base of the feet. The back has surface rust as expected. A beautiful antique fire thats size would suit both a living room or bedroom. The fire has a great quality and classic design that would suit both a period or modern property.